My name is Emmet Otter, and I work at Best Friend’s Animal Clinic. I am their guard dog, mascot, therapist, and muse. I came in as a very sick little puppy, they were not even sure I would make it through the next few days. Dr. Mokos and her staff put their heads and hearts into it and nursed me back to health. When I was finally healthy enough and strong enough, they started looking for my forever home. After a couple tries at placing me, Mom finally realized what I always knew, I was already exactly where I belonged! I mean where else are you going to find a home where your mom is a doctor? She’s will keep me healthy, and I get to go for rides with her every day, she even has my own staff of minions to do my bidding! Not to mention all the adoring fans that pop in here and there just to say hello to me, and sometimes they even bring my doggie friends! 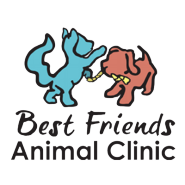 Thank you all for being our friends here at Best Friends Animal Clinic.